Great Lakes redirects here. For the African Great Lakes, see African Great Lakes. The North American Great Lakes. The Great Lakes are a chain of five freshwater lakes located in eastern North America, on the border of Canada and the United States of America. Consisting of Lakes Superior, Michigan, Huron, Erie, and Ontario, they form the largest group of freshwater lakes on Earth. The Saint Lawrence River is the primary outlet of these interconnected lakes, flowing through Quebec to the Atlantic Ocean. The lakes are bounded by the Canadian province of Ontario and the U.S. states of Minnesota, Wisconsin, Michigan, Illinois, Indiana, Ohio, Pennsylvania, and New York. Four of the five lakes form part of the Canada-United States border; the fifth, Lake Michigan, is contained entirely within the United States. Lake Champlain, forming the border between northern New York and Vermont, was briefly considered a Great Lake in 1998. The Great Lakes were formed at the end of the last ice age about 10,000 years ago, when the Laurentide ice sheet receded. When this happened, the glaciers left behind a large amount of meltwater which filled up the basins that the glaciers had carved, thus creating the Great Lakes as we know them today. The Great Lakes contain roughly 22% of the world’s fresh surface water: 5,472 cubic miles (22,812 km³). The combined surface area of the lakes is approximately 94,250 square miles (244,100 km²)—nearly the same size as the United Kingdom, and larger than the U.S. states of New York, New Jersey, Connecticut, Rhode Island, Massachusetts, Vermont and New Hampshire combined. 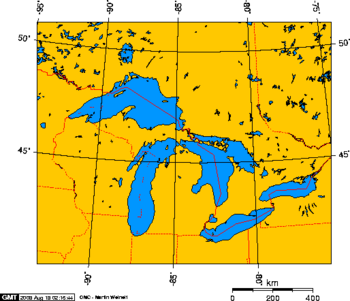 The Great Lakes coast measures approximately 10,500 miles (17,000 km). The Saint Lawrence Seaway opened the Great Lakes to ocean-going vessels. However the move to wider ocean-going container ships — which do not fit through the locks on these routes — has limited shipping on the lakes. This page was last modified 22:56, 12 July 2010.